Thanks to Ella the Kid for helping me with this review of the latest Wimpy Kid book! This review is based on a book report she wrote for class, but I added to it. Mama-daughter collaboration! The plot revolves around Gregory, aka the Wimpy Kid, looking for a date for the big Valentine's Day dance. Meantime, his dad's brother, Uncle Gary, moves in after losing all his money after buying a zillion shirts that are misspelled. Uncle Gary is full of dating advice...bad dating advice. After Gregory is turned down by every girl in school, he asks Abigail, after her date cancels, to join him on a group date with Rowley, his BFF. Gregory's mom is also freaking out because it's time for baby brother, Manny, to head to kindergarten! Alas, Manny prefers to play with his invisible friends and not flesh and blood kids. Will Uncle Gary ever move off Rodrick's favorite sofa? Will Manny make a real friend? What does the Valentine's Day dance hold for BFFs Gregory and Rowley? 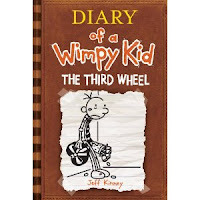 Read Diary of a Wimpy Kid: The Third Wheel by Jeff Kinney and find out! OK, get your kid a copy and they'll tell you! Ella the Kid recommends this book! She says that the story is creative and funny. Get a copy at Powells or Indiebooks. To enter just leave your name and email in the comments by 10 pm (Chicago time) on Saturday, December 1st. I will select a winner at random. GIVEAWAY offer is only for residents of the USA. Sorry, international readers! EDITED TO ADD: Congrats to Ayesha! 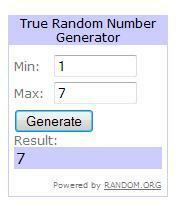 She was selected by Random.org as the winner of a copy of the Wimpy Kid Diary of her choice. Disclaimer: I received this book via a publicist, which is also how to able to offer a free copy. My daughter has just started getting into this series. I don't know what she'd do if she was able to get the latest installment for Christmas! I would love to win this for my son - he loves diary of a wimpy kid! Elliott is crazy about the Wimpy Kid and would LERVE a copy of "The Third Wheel." We love Wimpy Kid around here!